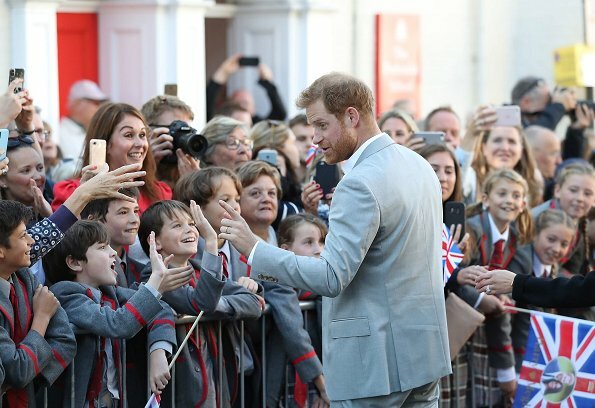 The Duke and Duchess of Sussex are making their first official visit to Sussex today. 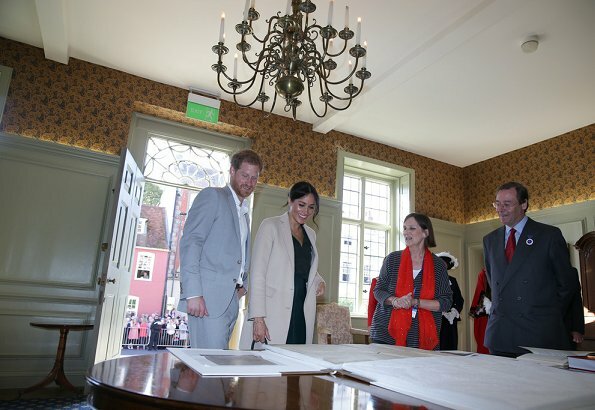 The Royal Couple firstly visited Edes House. 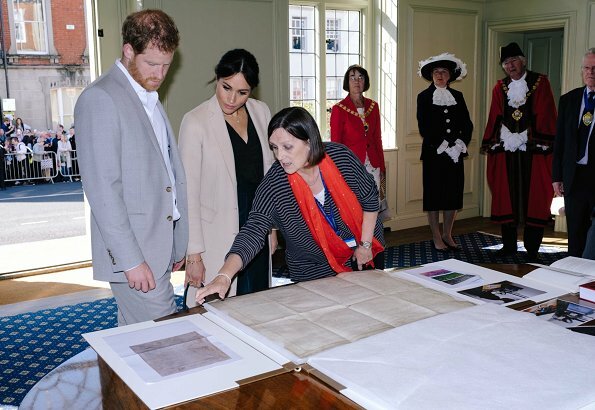 The Couple saw the Sussex copy of American Declaration of Independence at Edes House. Sussex Declaration is a handwritten copy. 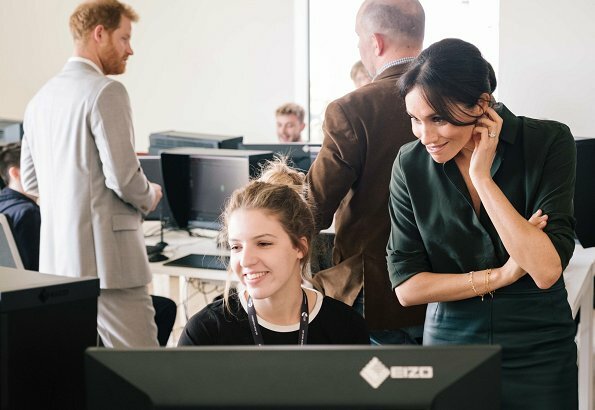 After visiting Edes House, the Duke and Duchess opened University of Chichester's Engineering and Digital Technology Park in Bognor Regis. After the opening ceremony, the Couple visited Peacehaven Youth Center. Love her entire ensemble. Lovely colours and the individual pieces fit her well and work perfectly together. Best of all, she looks comfortable and at ease. Well done! Her style is so over rated!! Love every piece she is wearing today. The coat is just what I would wear. Good job. This is my most fave outfit from her. Finally something that fits her well. Well done! She really have a sense of style. The entire dress looks very good, but especially I like the coat and the skirt. Nice bag as well. I like the green leather skirt. It is great. Do not care for the light shoes, would have preferred same tone green or just darker for fall. Will never be a fan of the shorter clumps of hair falling down by her face. Cute purse. Looking good GIRL!! :-D And I agree with the other poster(s); a genuine happiness and a great smile are always the best accessories. She needs to clip back those loose pieces so she does not keep messing with them. Or maybe it would be better to shave herself at all. Great style! 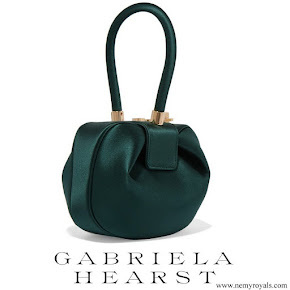 I like all the pieces, but especially the skirt and bag. The dark green is a great colour for her. However, I would not have paired skirt and blouse together. Two great pieces, but also two very different materials, and it's almost impossible to match the colours perfectly. So instead of these slightly clashing shades of green, I wish she had gone for a crisp white blouse (and straightened the collar under the jacket). Still, great outfit. Beautiful outfit - she looks lovely. Love her smile and confidence. No, the complaints about the messy bun are getting tiring. She has been a member of the royal family only few months now and you are already tired of her bun style. Wow, how often you change your own hairstyle? I love her bun and loose sides. LOL if she turns into Victoria mode, she will get complaints as well. In my opinion this is lovely and suits her very well. Gives her a romantic touch (which is probably the purpose). I think it is rather easy to see where the majority is. She has her own style that is the most important and does not need to copy anybody else. 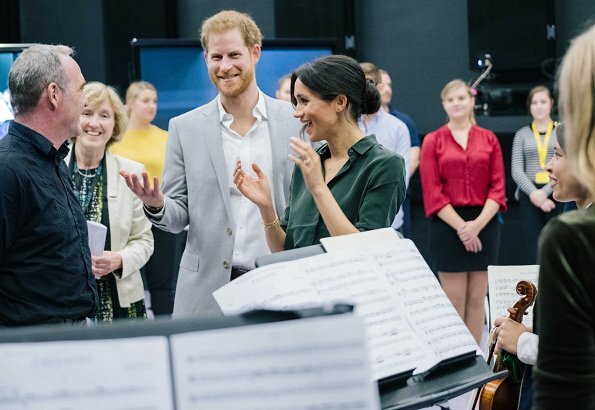 @gabriella I remembered some past posts saying Meghan should have put her hair in a messy bun when she had worn it down. It stuck out in my memory. I checked back to see who had posted the comments. 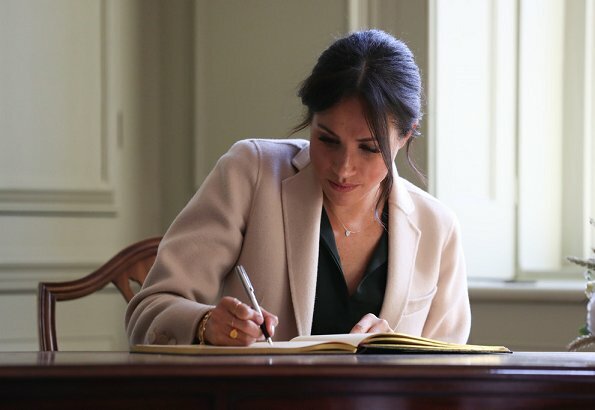 Your September 24th post under 2018 Coach Core Awards complains abouts Meghan's hair yet again: "She should have had her messy knot there." (The criticism continued.) You contradict yourself. There are people that just don't like Meghan. I wonder if that is where you are coming from. Chardonn8r, do you control what others are posting here? And if you don't like a post then you check it back in order to "convict" the poster? .... honestly?? I for one agree with Gabriella. I find Meghans hairstyle here annoying. Her outfit is fine - blouse, skirt (perfect length), shoes, everything looks very good - but then she almoust ruins it with this untidy hair. Her hair looks as if she did not take time to comb it and this is disrespectful towards the people she meets. Coralie, you are completely right about people "convicting" others on this site. Those writing their opinions have that right free from personal attack on them. I think Meghan does look nice here except for her messy hair. I never considered that it is disrespectful, but that is a good point. I am not convicting anyone. I happened to remember those posts. I can't help what I remember. Everyone has a right to his or her opinion. Gabriella contradicted herself, and I did call her out for that. And I do wonder why. 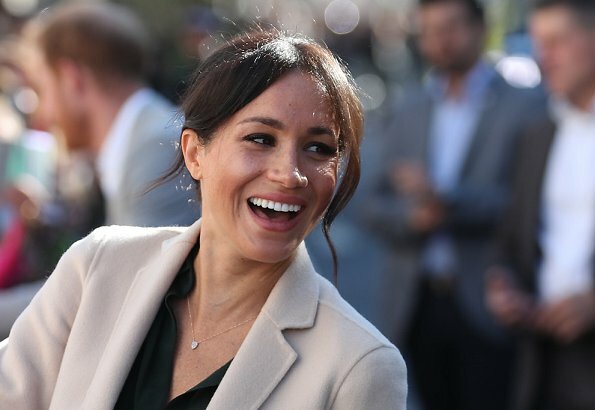 No matter what you think about Meghan's hair, there is no denying that there is quite a lot of Meghan bashing that goes on. She has been shamed for having skinny legs, she wears black or too much black or dark colors, her clothes are not tailored, her clothes are too loose or too tight or too long or too short, she needs a stylist, she needs a new stylist, she is not wearing stockings, she is breaking protocol, she shouldn't wear heels, OMG she touched her hair! They held hands!!! Not one other person we discuss on here gets picked on like Meghan does. There are definitely people that do not like her and the comments can get very mean and over the top. 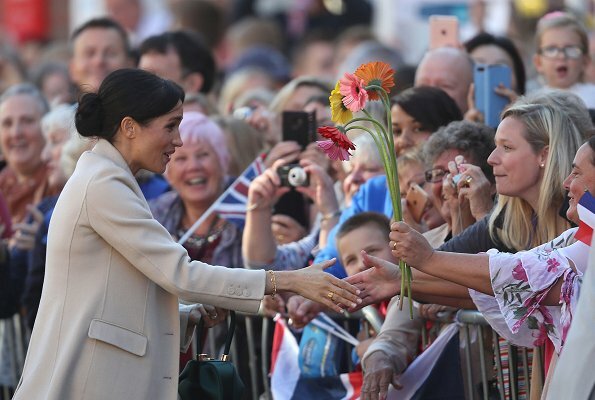 I respectfully disagree with you that Meghan's hair is disrespectful towards the people she meets. Clearly we see things differently, and that is what makes the world go round. This is the best possible skirt length on her. Longer skirts make her slim legs look stick like. 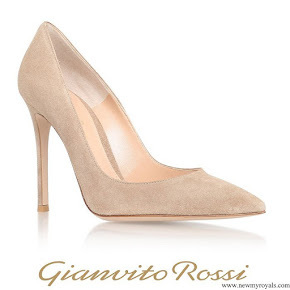 This length shows where the calf is wider and therefore gives the legs a better shape and proportion. Great style. 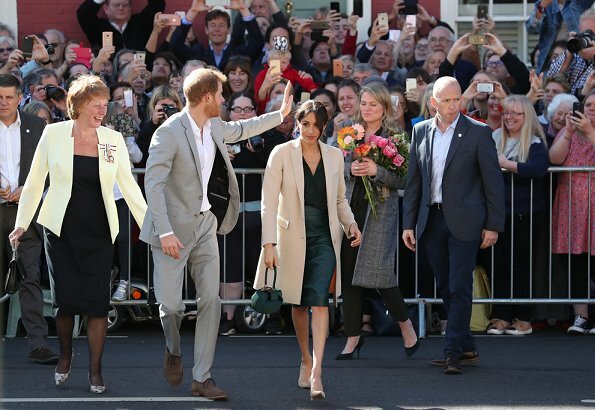 It's so lovely to see Duke and Duchess of Sussex holding hands. She looks great! They are so cute together and her smile is lovely. Doing a great job! This is such a winning outfit. Adding a lighter coat and shoes are just the right contrast. I LOVE her skirt, bag and shoes. Buying separates is smart. She will be able to create more outfits, and having simple, classic pieces means she will have them for years to come. Not a fan of this outfit. Two tones of green fighting for position. Don't think they quite go with each other. The shirt looks like it has a fold mark across it and has come straight out of the packaging and not been ironed. Isn't Meghan supposed to be Vegan?? 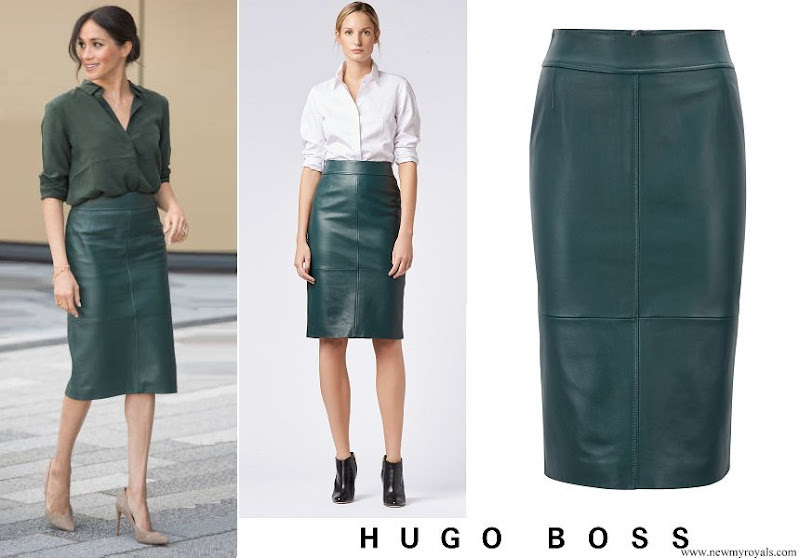 If so why the leather skirt??? No, she eats a lot of vegan and vegetarian food but she eats meat. They were roasting a chicken when Harry proposed. I love how natural she is..no airs and graces..
Great shoes, bag, and coat. Love the entire outfit. Well said! I agree with everything you said. 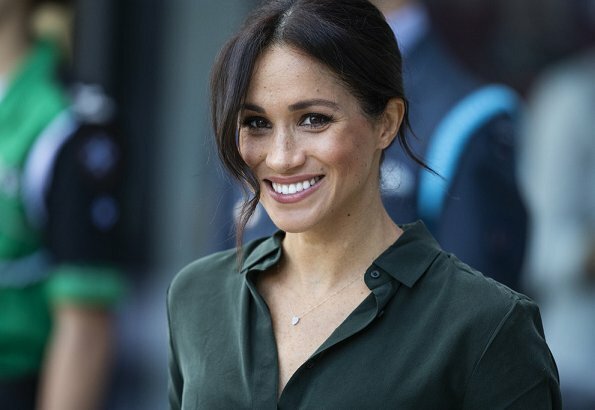 Meghan changes her hair style often, and there are still complaints! Princess Anne is someone they could focus on. Her hair has looked like a helmet for decades. Agree - thank you for your post! Amazing - her smile, her outfit, that's 100 % a fresh young look. Love it! Just lovely. Good balance of dark and light hues. She lost a little too much weight. If you have anything critical to say about her don't bother to post it here. 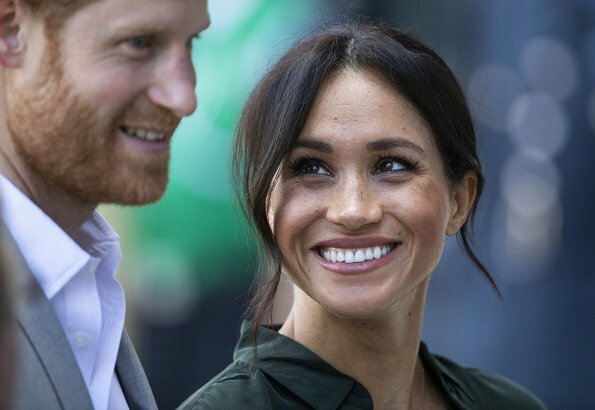 This seems to be the "I love everything about Meghan, and if you don't, shut up" site. She looks great. What about her hair???? Kate fiddles with her hair all the time, not only a loose lock, but more than a handful of hair that falls over her face. 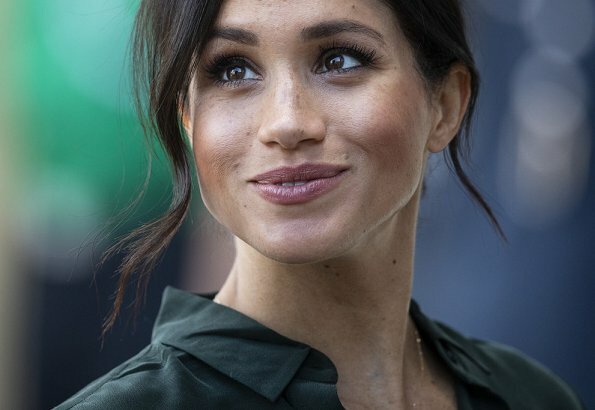 Meghan is fine, she has a lovely smile, warm eyes and, a very expressive face, unlike her sister-in-law who always looks the same. She is working hard, swimming against the current of nasty comments on several blogs, forums and tabloids. She looks great! meghan FOR THE WIN, YOU GO GIRl!!!!!!!!!!!!!!!!!!!!!!!!!!!!!!! !